Chop spinach and red peppers. Add a ½ tbs of butter to Instant Pot and set to "saute". When hot, add spinach and red peppers and saute for 1 minute. Press cancel. 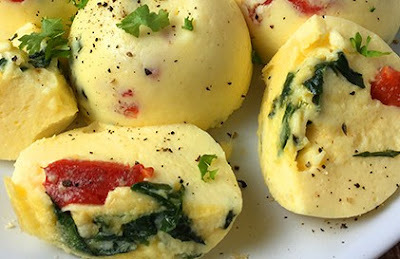 Spray egg bite mold with non-stick cooking spray and spoon red pepper and spinach mixture into each cup. Set aside. Pour egg batter into each egg bite cup about ¾ full. When all are full, use a spoon to mix the batter with the spinach and red peppers a little more. Add 1 cup of water to Instant pot, cover egg bite mold with foil and place on trivet and lower into pot. Secure lid with seal closed and set to "steam" for 8 minutes. When cycle is complete, let naturally release for 10 minutes, then quick release the rest. 0 Response to "BEST DAMN INSTANT POT EGG BITES"